On Saturday 25th of this year Jim Carrey was hosting the show Saturday Night Live for the third time. Jim opened the show with his very great monologue. 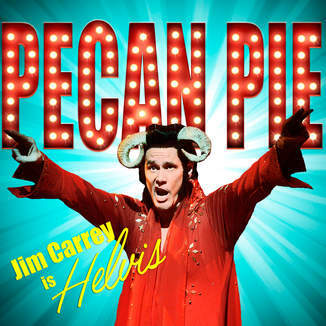 Jim appeared dressed as Helvis (Elvis + Devil) and sang to the audience the song "Pecan Pie". We already had listen to a small sample of the song in the special features of the movie "Eternal Sunshine of The Spotless Mind" but that day we could listen to the full thing. And now we finally can buy it and get it for ourselves, officially! Another great song from Jim Carrey. And while we wait for the full CD we get rock and roll to some "Pecan Pie". I already bought my copy. What are you waiting for? We at JCO will keep you updated as more pie comes along! -- Source: iTunes. Click to comment this article.